My Cactus Collection. cowbiscuits | UK Lifestyle, Style and Beauty Blog. : My Cactus Collection. I thought today, seeing as my whole life is still in boxes/between houses (today I had to walk to work in an oversized cardigan and leggings as I left all my clothes in the old house :'( ) I would share with you one of the loves in my life - my Cactus/Cacti collection! I love them! They come in all sorts of shapes and sizes - I even have a tattoo of a Catctus on my leg (you can see it at the bottom of the post or HERE) I've been learning alot about them and how to take care of them and what the different types are called. I found an awesome book on them in a charity shop which has been really useful. When this one bloomed I almost wept with joy! I stuck a birds skull that I had cleaned up in this one to give it that old desert feel. And for added house-plant greatness - my Venus Flytrap! Do you like plants? What if your favourite type? Oooh I think I need to get a venus flytrap.. My grandpa had one when I was little and I used to have great fun sticking things in it to make it close up. I do a like a boring spider plant actually... it seems to be the only kind of plant that I can look after. These are so cool, I need me some cacti! soooo cute! so much color! so goos for the everyday routine. 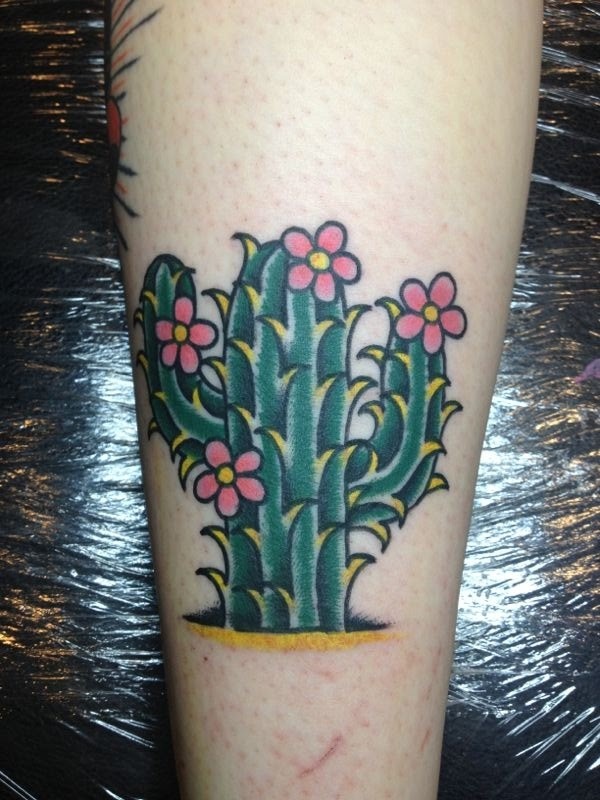 cute tattoo and this is such an amazing collection of cactuses! That's an awesome collection! I really need to get some more plants too. The problem is that one of my cats tries to eat all plants he can reach. I lovvve succulents and cacti in a home :) They're so cool. The venus fly trap is freakin' awesome too! I may need one. What a great little collection. I've been really wanting to start one myself. Growing up in the desert I was surrounded by them, but now I live no where near any, sadness. But your little collection is definitely the little push I need to finally start my own! My fella and I joke that we have black fingers not green - every plant that comes into our house dies a horrible death. Even the two cacti I owned as a teenager perished and as you probably know it takes a lot to kill them!